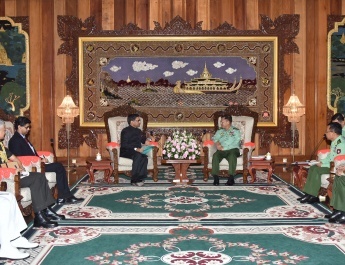 Commander-in-Chief of Defence Services Senior General Min Aung Hlaing received a delegation led by Vice Minister of Foreign Affairs Mr. Kong Xuanyou of the People’s Republic of China at the parlour of Bayintnaung Villa, here, this evening. 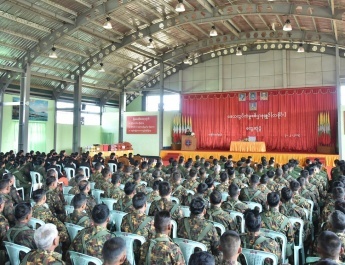 Also present at the meeting together with the Senior General were Deputy Commander-in-Chief of Defence Services Commander-in-Chief (Army) Vice-Senior General Soe Win and senior military officers from the Office of the Commander-in-Chief (Army). 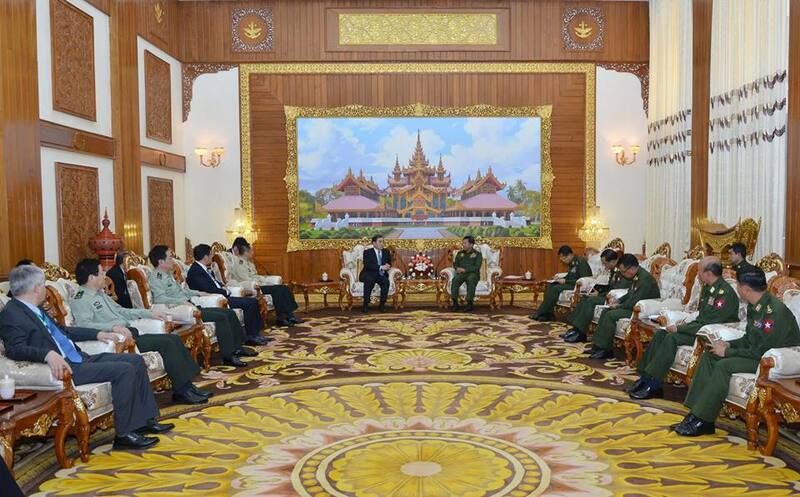 The Chinese Vice Minister of Foreign Affairs was accompanied by Deputy Chief of the Joint Staff Department of China’s Central Military Commission of the Chinese Communist Party Maj. Gen. Shao Yuanming, Chinese Ambassador to Myanmar H.E. 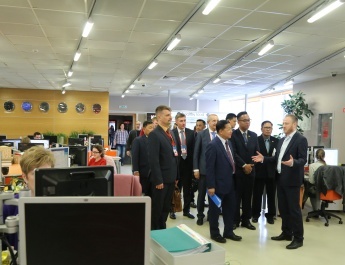 Mr. Hong Liang, Military Attaché Sr. Col. Xioang Shaowei and officials. 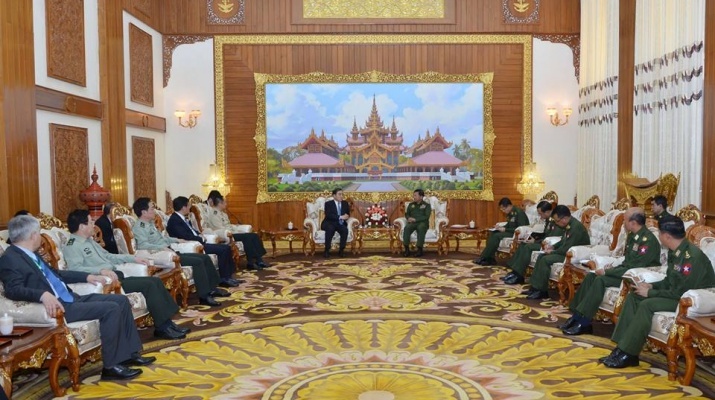 At the meeting, they cordially exchanged views on results from the 2+2 Advanced Meeting led by the Myanmar-China Foreign Ministries and Defence Ministries and progress in implementation, efforts of the Tatmadaw to restore internal peace and carry out peace and stability of border region between the two countries, assistance of China in internal peace processes of Myanmar, support of China to Myanmar Government and the Tatmadaw which solved the terrorist problems in Rakhine State, and talks on enhancement of friendly relations between Myanmar and China discussed by Commander-in-Chief of Defence Services Senior General Min Aung Hlaing on his goodwill visits to China in meeting with Chinese State leaders and military leaders led by Chinese President Mr. Xi Jinping. 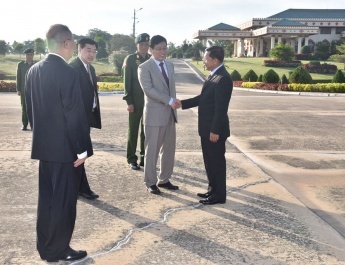 After the meeting, the Senior General exchanged commemorative gifts with the Chinese Vice Minister of Foreign Affairs and the Deputy Chief of the Joint Staff Department of China’s Central Military Commission of the Chinese Communist Party and posed for documentary photo together with those present.